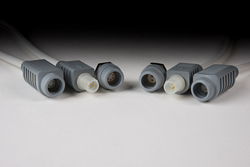 ODU, a worldwide leader in designing and manufacturing high performance connectors, is launching its lightweight preassembled ODU MINI-MED® connector solution to the US market. The German-engineered ODU MINI-MED® is a compact and cost efficient preassembled plastic connector solution with break-away function designed for medical, industrial and test and measurement applications such as: portable patient monitoring systems, insulin pumps, catheter systems, blood pressure monitors, barcode scanners, e-bikes, fitness and wellness machines or measuring sensors. ODU MINI-MED® offers additional features such as: up to 1,000 mating cycles durability, 2-6 contacts, IP 67 when mated, gold plated contacts with soldered connection, mechanical keying, blind mating, assembled with PVC or extremely flexible silicone cable, available in cable lengths from 0.5m to 5m, operating temperature for PVC cable: -15ºC to +80ºC, DEHP free. ODU-USA is 100% vertically integrated and provides in-house molding and custom connector capabilities, cable assembly integrated solutions, competitive lead time, rapid prototyping and product development, local one-to-one engineering support, factory direct. The ODU Group is one of the world’s leading suppliers of connector systems, employing 1,650 people around the world. In addition to its company headquarters in Mühldorf am Inn (Germany), ODU also has an international production and distribution network throughout Europe, North America and Asia. ODU combines all relevant areas of expertise and key technologies including design and development, machine tool and special machine construction, injection, stamping, turning, surface technology, assembly and cable assembly. The ODU Group sells its products globally through its eight subsidiaries in Denmark, England, France, Italy, Sweden, the US, China and Japan, as well as through numerous international sales partners. ODU connectors ensure a reliable transmission of power, signals, data and media for a variety of demanding applications including medical technology, military and security, eMobility, energy, industrial electronics, and measurement and testing.